That's right, I finally had a small break in my schedule to work on TN. I managed to write a couple hundred more words and a really cool exterior as well. And when I say really cool, I mean really really hot. The area looks downright awesome I have to say. There's several quests that run through it, one of which is the main one, but you can visit there before then and do some side quests. Surag is a small fishing community positioned off the shore of the Surag River and a few miles (or kilometers) from Lake Thaylambar. The villagers have been having issues with these nightly attacks lately. Upon daybreak, they would notice that one of their people had been murdered during the night. Breaking the quest down into it's basic form, you're presented with a conspiracy, and you have to determine who the culprit is and choose a side from that point. I'll be honest with you, the correct answer (if there is even one of those ;) ) is not obvious. 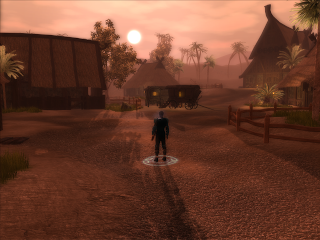 I have one screenshot that shows off the village some while I was still working on it. It looks relatively the same, maybe some color adjustments and what not. The caravans in the center of the picture is a fish stand, the main centerpiece of the community. In the upper right hand corner, you'll see the Chief's house. The other buildings are either empty or not very important. Not shown is the small dock on the Surag River featuring small fishing boats and some dunes. But that's all I've got for today. I like the village, the lighting is awesome. Thanks all. I'm going to try and push for a screenshot every Tuesday night (EST GMT-5) or so. So expect one in about 48 hours or so.